Fort Adams: Exploring America's Largest Coastal Fort ~ The History Girl! Most know Newport, Rhode Island for its luxurious and ostentatious residences that were the summer "cottages" of the industrialists and robber barons during the Gilded Age. But not far from those grand homes is a fortification that would have protected the the harbor and the residents of this seaside resort town from enemy attack. Although it never fired a shot of aggression, the largest and most complex coastal fortification built in America is Fort Adams. A fort to protect Newport, Rhode Island was conceived of as early as the 1673, when Goat Island was purchased and lots laid out, including land set aside for defenses. Work did not begin on earthen fortifications until 1700. In May 1702, the Rhode Island Assembly ordered a new fortification large enough to mount twelve cannon during the War of Spanish Succession (1702-1713). The new fort was named Fort Anne, after Queen Anne who took over the throne in March 1702. Fort Anne was deactivated after the war and was renamed Fort George in 1730. A series of disarming and rearming Newport's fortifications began and lasted through the American Revolution. The defenses did not hold up to the British attack and Newport fell under British control on December 7, 1776. The British remained in Newport until they evacuated in October 1779. After the war, the forts around Newport fell into a state of disrepair. In October 1784, the Rhode Island Assembly ordered that the works on Goat Island be repaired and armed. The fort was renamed Fort Washington. Concerned by the outbreak of war in Europe in 1793, the United States Congress appointed a committee of artillerymen and engineers to study coastal defense needs. Twenty-one locations, including Newport, were selected by the committee to receive new forts, which would be known as the First System. The original Fort Adams was established on July 4, 1799. It was designed by Major Louis de Tousard of the Army Corps of Engineers. The fort was built to mount twelve cannon and was garrisoned during the War of 1812 by Wood's State Corps of Rhode Island militiamen. 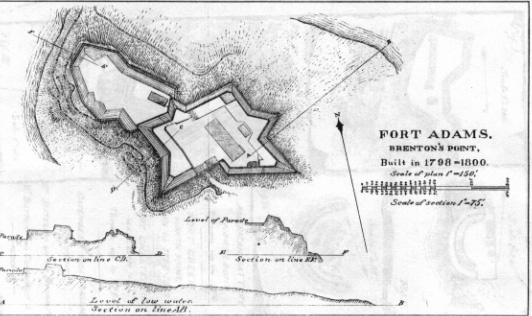 After the War of 1812, a review of the nation's fortifications determined that Fort Adams was inadequate and a newer and much larger fort would need to be constructed. Old Fort Adams drawn by George W. Cullum after the original by Tousard. The new Fort Adams was designed by Brigadier General Simon Bernard, a Frenchman who had served as a military engineer under Napoleon. Bernard designed the new fort in the classic style of Vauban and it became the most complex fortification in the Western Hemisphere. Sébastien Le Prestre de Vauban was Louis XIV's military engineer who took the star fort design to the extreme during the late seventeenth century. Construction of the new fort began in 1824 and continued at irregular intervals until 1857. It was a massive undertaking. From 1825 to 1838, construction was overseen by Colonel Joseph Gilbert Totten, the foremost American military engineer of his day. The labor necessary to construct the fort was more than Newport and the surrounding areas could provide. Laborers from Ireland were hired to construct the fort, which used over four million bricks, over 48,000 tons of granite block, and over 20,000 tons of rubble stone. By 1831, over four hundred Irish workers labored six days per week. Wages varied depending on the skills and trade required. Records from that year show that two hundred and fifty men moved dirt for $1 per day, while fifty-two masons worked for $1.72 per day, and one wheelwright and two blacksmiths earned $1.23 per day. Once completed, this imposing fort covered twenty acres. It was and still remains the largest coastal fortification in the United States. It was built to house 2,400 men and 468 cannon. This granite, brick, and shale fort covers 871,200 square feet and dwarfs other forts! In comparison, Fort McHenry in Baltimore, built in 1798, was only 85,000 square feet and held 150 soldiers and 60 guns. Fort Sumter in Charleston, South Carolina, built in 1829, covers 56,000 square feet and had a capacity of 650 soldiers and 135 guns. Both of these forts could fit within the boundaries of Fort Adams and have plenty of space to spare! Since it took approximately thirty years to complete, enough of the fort was finished by August, 1841 that it could be garrisoned with troops. A view of the 6.5 acre parade ground inside the fort and the western casemates. Fort Adams was designed to be self-sufficient in order to survive a siege. The design included facilities for food, water, sanitation, and medical care. When Frenchman Bernard was assigned the task of designing the fort, he took great pride in the responsibility, thus making this one stand out among all previous U.S. forts. Particularly, fort engineers believed that any fort could fall after a prolonged siege. Earthworks and outworks were constructed as part of the defense of the main walls of the fort to slow down the enemy and allow time for reinforcements to arrive. Near the east gate to Fort Adams, earthworks and a redoubt were constructed. The redoubt near the east gate was a small fort that would protect the main fort if it ever came under attack. This one story granite structure was converted to a jail by 1900 and a second story was added. By the 1930s, the second story was removed. The Fort Adams Trust reconstructed the second story to house offices for the organization in 2009. Other obstacles were built to slow down an enemy during a land assault. Fort Adams had a multi-tiered defense that included another redoubt south of the fort and a large glacis, or gentle slope of land away from the fort without any cover. Enemies approaching up the glacis were at a disadvantage compared to those at the top of the glacis. In addition, anyone coming up the slope could be easily seen and targeted. If the enemy was successful in getting past these areas, they would be at the exterior ditch, which would funnel the enemy into a channel where they would face heavy musket and cannon fire. A tenaille, or wide angular defense work used to protect the main walls was also built. From there, the interior ditch and exterior front were two of the last defenses, if the enemy was able to get that far inland. The fort's builders were also concerned about enemies who may circumvent a land attack and tunnel underground. But plans were made to prevent an underground attack by building listening tunnels into the surrounding land so that enemy digging operations could be heard. If enemy digging was detected, soldiers would then dig a tunnel toward the enemy. Once close, they could set off charges to destroy the enemy tunnels. Fort Adams contains 3,110 feet or .59 miles of underground tunnels constructed of stone and brick of varying heights. Listening tunnels at Fort Adams. The late nineteenth century brought about changes in weapons and defense. New ships with high-powered guns were no match for the fort's walls. In order to remedy this, Fort Adams expanded outside of its walls in the 1890s. The Army constructed six new batteries with modern cannons and mortars which could fire at greater distances. From this point onward, the fort primarily transformed into soldier housing. Since its construction, soldiers had complained of damp conditions at the fort. Between 1906 and 1908, the Army constructed brick barracks atop the south wall to improve living conditions. The eastern half of the barracks burned in 1947. New officer's quarters were built south of the fort in the early years of the twentieth century. A view of the unrestored areas of Fort Adams. Fort Adams also served as the headquarters for all fortifications in Narragansett Bay, as well as, a training center in both world wars. During World War I, the fort was a depot for units departing to fight in France. Three regiments of artillery were formed and trained at Fort Adams. During World War II, over 3,000 soldiers were assigned to the Harbor Defenses of Narragansett Bay. The southwest battery was the advanced position for directing fire against enemy warships. Eleven large fifteen-inch Rodman cannons were positioned at the fort, capable of hurling their projectiles a range of two-and-one-half miles. An anti-submarine net was stretched from Fort Adams across to Jamestown, to prevent the entry of enemy submarines. Additionally, two observation posts were installed on the west wall of the fort. As the war progressed, the number of troops was gradually reduced to about 500 by the end of the war in 1945. The fort functioned as an active Army post until 1950. In 1953, the Army gave Fort Adams to the Navy, which still uses some of the grounds for family housing. 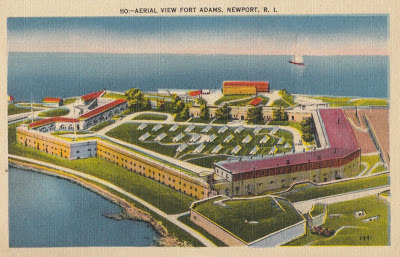 In 1965, the fort was given to the State of Rhode Island for use as Fort Adams State Park. Fort Adams was declared a National Historic Landmark in 1976. Between these changes in ownership, the fort was not well-maintained, the property was overgrown, and vandalism was a constant problem. Even a few fires of unknown origin damaged portions of the fort during these years. Finally, in 1994, the Fort Adams Trust was established. This group of volunteers worked tirelessly to reopen the fort for tours and begin restoration of the grounds. Since then, gates and grills have been installed to deter vandalism, interpretive signs have been installed throughout the complex, the northern casemates, east wall roof, and earthen ramparts restored, and the redoubt/jail was reconstructed to its early twentieth century appearance. It will take millions of dollars and thousands of hours to fully restore Fort Adams to its former glory, but these small steps taken over the past nine years show a promising future for the fort that was once a flagship of ingenuity and technology for the United States Army.